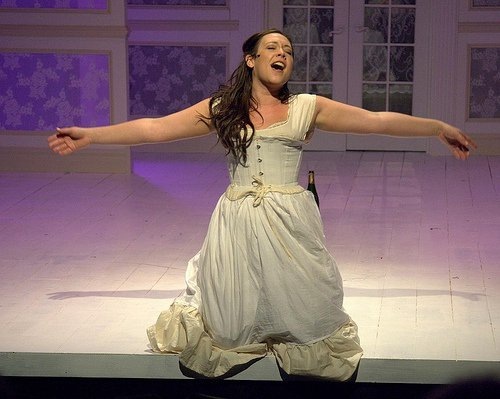 Stephen Sondheim’s musicals often contain an element of nostalgic regret, focusing on characters that look back on their muddled pasts in hopes of achieving, as A Little Night Music’s Desirée Armfeldt (Anita Hoffman) says, “A coherent future.” The aging artists of Follies, the fairy tales of Into The Woods, Sweeney Todd’s titular anti-hero – these are just a few of the composer’s characters that are faced with the consequences time brings, and A Little Night Music is one of the most chronology-focused musicals in Sondheim’s canon. Key words like “now,” “soon,” “later,” and “meanwhile” are repeated to emphasize the passage of time, unified by the inquisitive “remember” that sparks the characters’ trips down memory lane. The past, present, and future intersect in a delicate waltz, and Sondheim writes most of the show’s music in ¾ time, overlapping the melodic themes with his signature complexity and precision. Bob Knuth’s staging is similar to Trevor Nunn’s recent Broadway revival, with a similarly clean, white-washed set design also from Knuth, and the production’s technical aspects have a similar level of polish. Elizabeth Powell Wislar’s costume design is particularly stunning, and these characters are dressed with the level of elegance and sophistication worthy of their status. Knuth assembles a cast that handles the difficult music especially well, layering the moving voice parts with a great sense of timing, and crisp articulation that is much appreciated during intense numbers like “Weekend in the Country” where multiple parts are being sung simultaneously. Desirée’s five actor companions serve as an observing chorus, and they begin the show with an overture that establishes the melodies that will be revisited throughout the show. In the temporal context of the show, the overture becomes more than just a collection of the show’s most memorable tunes, but rather plants seeds that will later be cultivated by the other actors in the ensemble. 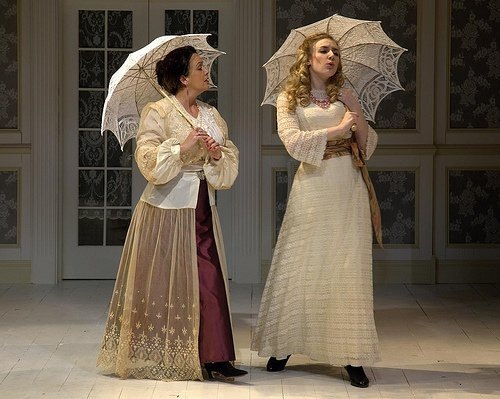 This is a musical about relations – husbands and wives, parents and children, the young and the old – and despite the occasional instance of overacting, Knuth’s cast succeeds in building the character connections that are elevated by Sondheim’s rich music. Hoffman anchors the production with her captivating portrayal of Desirée, capturing the weariness that comes with the touring life and the desire to finally obtain a life of stability with her daughter Fredrika (Alicia Hurtado). When she reunites with her past lover Fredrik Egerman (Kirk Swenk), she sees an opportunity to finally have the life she dreams of, but Fredrik’s eighteen-year-old wife Anne (Stephanie Stockstill) stands in their way. Matters are further complicated by Desirée’s preexisting affair with an insanely jealous dragoon Count Carl-Magnus Malcolm (Jeremy W. Rill), whose destitute wife Charlotte (Deanna Boyd) tells Anne about Desirée’s affairs with both their husbands. As Desirée’s partners, Swenk and Rill both showcase strong vocals, and there’s a clear contrast in their affection for Ms. Armfeldt. Fredrick genuinely longs for her on an emotional, whereas Malcolm desires her on a solely sexual level, and Rill gives Malcolm an exaggerated arrogance that works for the character, especially with his powerful singing. As his wife Charlotte, Boyd gives the character an appropriately dreary disposition, but she becomes too much of a caricature when her character breaks out of her depression. Stockstill’s Anne is delightfully naïve at the start of the show, still a child despite having been married for eleven months. 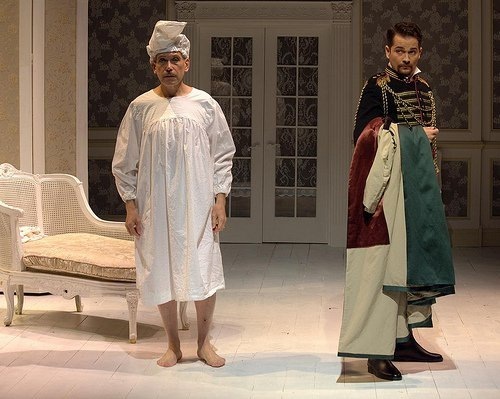 The adorable flirtation between Anne and her step-son Henrik (Patrick Tierney) shows how innocent she is in comparison to women like the Egermans’ amorous maid Petra (Khaki Pixley), depicting an Anne who is anxious to explore her sexuality but not with her own aging husband. Stockstill has a beautiful singing voice, and her duet with Boyd, “Everyday A Little Death” is a heartbreaking revelation that underneath the sexual comedy these are people in pain. Henrik is the play’s bleakest character, and Tierney does admirable work balancing the character’s jaded opinion of the world with a desire to find the kind of the love that he so publicly renounces. Tierney, along with Rill, has some of the most difficult music in the show, and while there are times that he could use some more support to stay on key, he does strong work with difficult material. 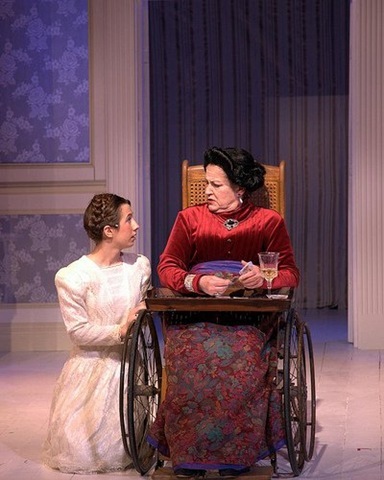 Fredrika and her grandmother Madame Armfeldt (Patti Roeder) represent the two ends of the time spectrum, as Madame lives in the past, while Fredrika is constantly looking toward the future. Roeder’s solo “Liaisons” could be considered the play’s theme, a meditation on how the affairs of her past have been grow more beautiful with age while the longing to return to them grows more painful. At the end of the play, Madame Armfeldt regrets turning away one of her lovers for giving her a wooden ring, lamenting the lost opportunity for true love. Desirée has a similar epiphany in “Send in the Clowns,” impeccably performed by Hoffman, where she finally exposes her true feelings to Fredrik before time passes them by again. After spending the play trying to recapture the past as a way to fix the present, she takes the leap into a future with Fredrik. When his responsibilities to Anne prevent him from jumping with her, Desirée ends the song with a defeated yet optimistic, “Maybe next year.” Time passes and things change. Things grow with time and they die with time. But perhaps the greatest power of time is the hope that the future brings, healing the wounds of the past and making the present an easier place to live. All images by Bob Knuth. 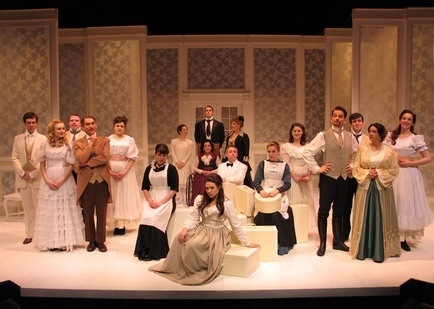 Five more or less married couples and their seemingly confirmed bachelor friend–the contrast between their ambivalence and his fecklessness fuels this early, episodic Stephen Sondheim musical, a show with enough brains to hit the heart. So, if Bobby remains unyoked at 35, it could be because his “institutionalized” friends have set cautionary examples with their drugging, boozing, infidelities and threats of divorce. And Bobby’s lusty life of interchangeable dates is its own dead-end excuse for a mid-life crisis. 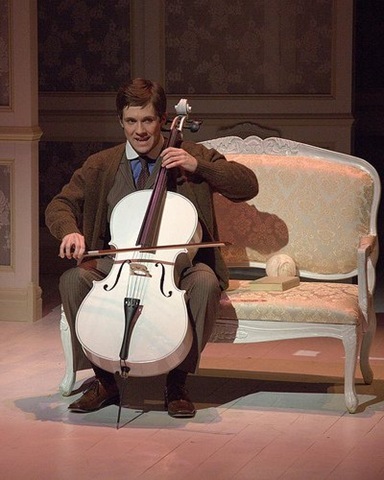 Those songs, ably directed by Jonathan Berry, revolve like a carousel around eligible bachelor Bobby, a very un-lonely New Yorker who just turned 35 and receives contagious concern from the compulsively, reflexively or instinctively married couples who comprise his industrious friends. (The slick plot, with its sitcom setups and twisting revelations, recalls bookwriter Furth’s own The Supporting Cast and its gay counterpart, Paul Rudnick‘s Jeffrey.) Bobby’s tensile friends include control-freak Sarah and her co-dependent husband Harry; Southern-belle Susan and her estranged and closeted Peter; amiable Jenny and considerate David (who would love to be single "for an hour"); frantic Amy, a shiksa who almost doesn’t marry her adoring Paul; and sophisticates Larry and Joanne. Joanne’s amorous assault will help to shock Bobby from his fear of commitment. It also fuels the ending, where he determines to be himself, enough to realize one’s company and two’s a crowd. For them and for the three women in and out of Bobby’s life (sweet stewardess April, ebullient Marta, "the soul of New York," and knowing Kathy, the girl who got away), Sondheim delivers delicious numbers, ranging from Marta’s New York tribute, "Another 100 People," to the sardonic anthem "Crazy Person." Company is a hungry show, eager to assert its sometimes borrowed wisdom: Griffin’s rough-and-tumble urgency fits the bill, and here, despite a too-slow and deliberate second act, the ensemble acting is everything a chorus should be. An instantly likable anti-hero and a solid survivor, Benjamin Sprunger’s Robert (who is almost exactly the right age for the character) conveys both the curiously unattached “Bobby baby, Bobby bubbie” who fascinates his friends and the haunted loner who aches for connection in the enthralling “Being Alive.” (Sprunger brings so much hunger to the number that you can imagine, from a slightly different perspective Bobby verging on tragedy instead of tragicomedy.) Amid so much Gotham craziness he’s a grounded, solid soul who stands out by hanging back. Standouts among Robert’s 13-member supporting “family” include Allison Cain whose bibulous ferocity in “The Ladies Who Lunch” makes you reconsider Prohibition and recalls Elaine Stritch but with repression as much as rage. Samantha Dubina’s winsome stewardess (so moving in “Barcelona”) says a lot with the look of longing. Dana Tretta incarnates the free spirit of 70s New York as a date too independent even for freedom-loving Bobby. Darci Nalepa runs Amy’s tour-de-force “Getting Married Today” along a fine knife edge between hope and farce. Company may seem dated in its view of the Big Apple as a couples’ mecca where anonymity and intimacy constantly vie for dominance. (References to the “generation gap” and phones that lack even an answering machine don’t help this updated production.) But the interpersonal dynamics so cleverly lampooned and confirmed by these songs remain in full force: The show keeps the crowds it earned. Mary Zimmerman is the mastermind behind The Goodman Theatre’s new musical production of Candide. The Tony-award winner not only directed the epic, whose plot literally spans years and oceans, but she also adapted the script. Normally, I’m not a fan of one person having such a heavy hand in the development of a drama. Having a separate writer and director has major benefits, namely the benefit of distance from the work. And it is this distance that can fix any glaring errors in the script or add directorial nuances to strengthen the production. Fortunately, Zimmerman has crafted a cohesive, entertaining and visually stunning piece of work. Thanks to her affinity for levity, Zimmerman saves Voltaire’s classic philosophical narrative from becoming crushed under the weight of its own ideology. I’m amazed that such a sprawling script and dense story can be so digestible. Candide begins peacefully enough, with Candide (Geoff Packard), a young lad of unremarkable lineage, studying with blue-blooded siblings Cunegonde (Lauren Molina) and Maximilian (Erik Lochtefeld). They are learning metaphysics from their instructor Pangloss (Larry Yando), whose core belief is that this world is the best of all possible worlds. 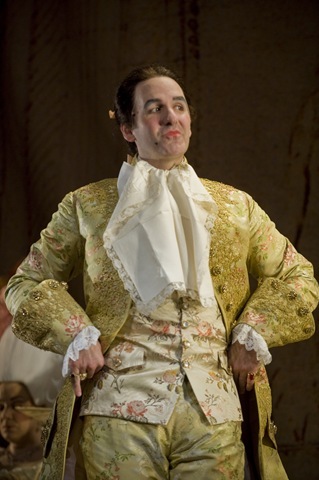 Although wonderfully optimistic, his mantra is also incredibly naïve, a fact that Candide soon learns. 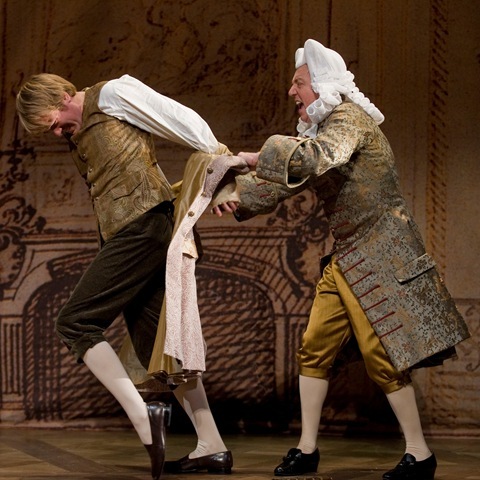 Once the Baron (Tom Aulino) discovers his daughter, Cunegonde, passionately throwing herself at Candide, the young boy is banished (and we witness a scene transition that is surreal as it is stunning). 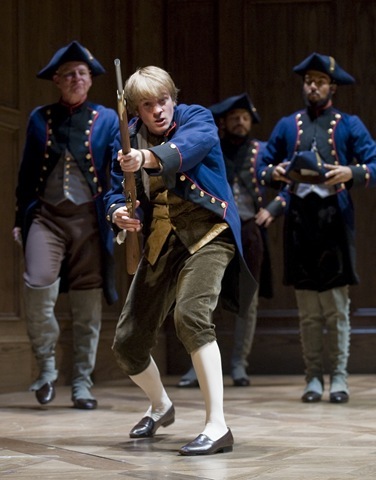 Now Candide is on his own; caught in the middle of war-torn Europe with only Pangloss’ feeble-minded philosophy to guide him from one atrocity to another. The play does Voltaire’s work justice. Zimmeran does a wonderful job highlighting the short-sightedness of optimism in the face of pervasive human tragedy. For example, the musical’s darkly humorous number “Auto-da-fe,” a song about a town’s eagerness to witness public executions, is instilled with a playful, cartoonish enthusiasm that makes the capital deaths that much more disturbing. Candide is also very funny. 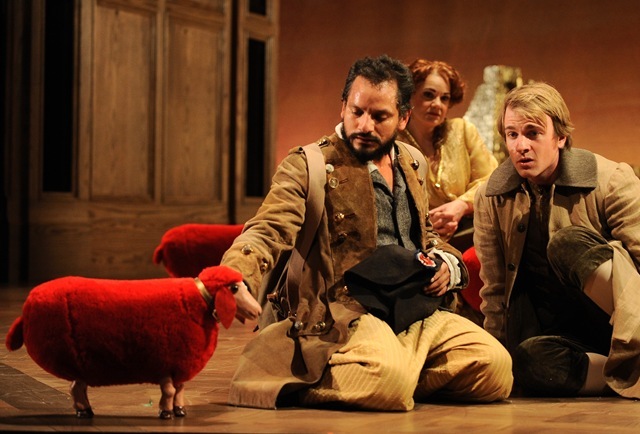 For instance, there’s a running gag with a flock of red sheep, which, although a little silly, provides some light-heartedness to a play that is otherwise filled with people getting maimed and mutilated. There are also some subtle gags, like the use of miniatures to convey the scene’s setting. In one scene in particular, Candide and his travel companions face a storm while at sea. Although the stage does not resemble a boat at all, an actor moves a small boat on a pole to illustrate the tossing and turning of the vessel as Candide and others rock back and forth in unison. Daniel Ostling’s set design is minimal but striking. A large wood-paneled wall occupies all of stage right where secret compartments allow characters and props to easily enter and exit. Trapdoors are used generously, which extends the world of the play farther beyond the extraordinarily roomy stage. Despite all these positives, there is one flaw to Zimmerman’s work that I cannot overlook. By being so close to this production, she has blinded herself to the fact that by infusing Candide with so much comedic sentiment, she guts the characters of relatable qualities. Actors often indicate rather than act and sport affectations that comment on the work rather than serving as part of the work. 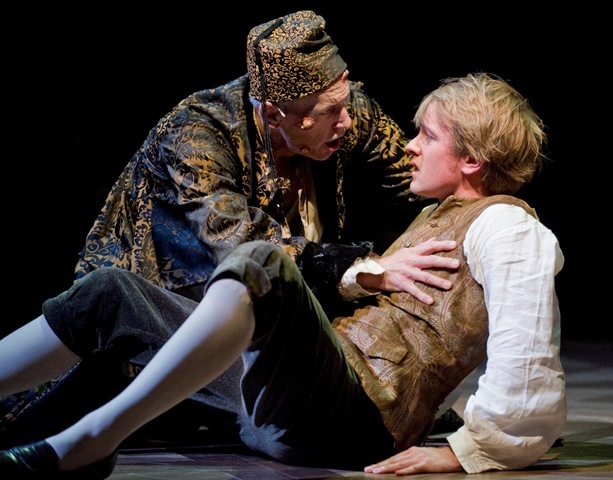 In making these characters merely pawns in a farce, we aren’t really invested in them, and thus the stakes for Candide to eventually find his lost love Cunegonde are set so low that we really don’t care whether they’re reunited or not. Still, Voltaire’s work isn’t so much about separated lovers as it is a commentary on the contemporary philosophies of his day. And Zimmerman’s work is effective at bringing Voltaire’s talent for satire to life. So this drawback does not overshadow the fact that Candide is a very good play, not necessarily the best of all possible plays, but a good play nonetheless. "His touch is too deliberate, somehow." That lyric, from the 1984 Tony Award and Pulitzer Prize-winning Sunday in the Park with George, might well describe Porchlight Music Theatre Director L. Walter Stearns’ uneven revival, which somehow fails to connect the dots of the Stephen Sondheim musical. Sondheim James Lapine’s imagined backstory behind 19th-century painter Georges Seurat’s pointillist masterpiece "A Sunday on La Grande Jatte" (now housed at the Art Institute of Chicago) has only a tangential relationship to the real biography of the groundbreaking neoimpressionist whose early death deprived the art world of what surely would have been a brilliant career. Instead it concentrates on the troublesome issues of balance between art and life, work and relationships, ambition and practicality. The artist calls for "Order. Design. Composition. Tone. Form. Symmetry. Balance" — elements that can make or break any work of art. This imbalanced production falters under too much design and not enough tone. Hidden behind the scenes, Music Director Eugene Dizon on piano and his orchestra — Carolyn Berger, violin; Michelle Lewis, cello; Allison Richards, viola; Patrick Rehker and Derek Weihofen, woodwinds; and Jennifer Ruggieri, harp — do a stellar job with the music. Unfortunately, many of the singers don’t measure up. Amanda Sweger‘s massive backdrop and Liviu Pasare‘s distracting video projections overwhelm the small stage and the cast as well. Brandon Dahlquist ably captures George’s sensitivity and absorption, with an expressive face that suggests the real Seurat’s soulful looks and a fine tenor. Yet too often he’s obscured behind the scrim or facing away from the audience. (John Francisco will take this role for the final three weekends of the run.) Seurat’s painting may be the subject of the play, but we really don’t need to see it all the time. An empty stretcher would have conveyed the idea of the work just as well and allowed us to see the actor’s face. On the other hand, Jess Godwin’s passion is all in her face and rarely in her singing. Playing George’s lover, Dot, the animated and lovely Godwin displays an almost palpable yearning for the artist. The slender redhead bears no resemblance to the Seurat’s actual mistress, Madeleine Knobloch (the buxom subject of "Young Woman Powdering Herself"), which doesn’t matter, but her voice often sounds as thin as her figure, and that does. Several members of the supporting cast put in excellent performances, however. Sara Stern is superb as George’s peevish, elderly mother. Her fabulous version of "Beautiful" is the highlight of Act I. Sarah Hayes and Daniel Waters do a hilarious job as the unhappy American tourists. Bil Ingraham and Heather Townsend are aptly haughty as the successful painter Jules and his wife, Yvonne, delivering tittering pronouncements on George’s work in "No Life," and Michael Pacas makes a wonderfully wry and full-voiced boatman. The second act, which jumps forward to a modern artist, also named George — a fictional great-grandson of Seurat — seems much stronger, as if the cast and crew felt more comfortable in the 20th century. Dahlquist, now fresh-faced and beardless, is out in front here. But Godwin, now portraying George’s grandmother, sings "Children and Art" so softly she’s nearly inaudible. Sunday is one of Sondheim’s more challenging musicals. Porchlight would have done much better to concentrate on the essentials of light and harmony instead of reaching for the heavy design elements that weigh down this production. "Art isn’t easy, no matter how you look at it." Porchlight Music Theatre hosts a benefit concert, "By Popular Demand," at 7:30 p.m. Monday, Oct. 11, at Mayne Stage, 1328 W. Morse Ave., Chicago (map). 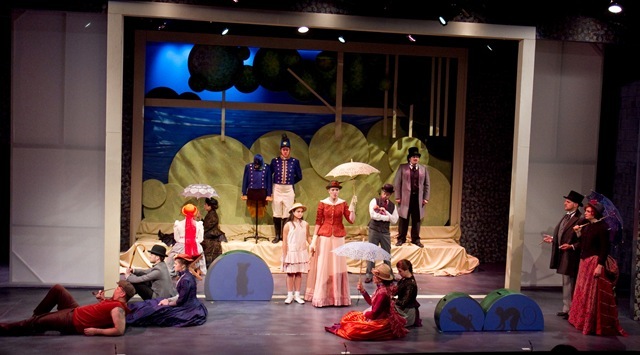 In Act I, singers Jayson Brooks, Sean Effinger-Dean, Nick Foster, Jess Godwin, Lina Kernan, Ryan Lanning, Bethany Thomas, Joseph Tokarz and others perform. At intermission, the audience votes to determine who’ll return to sing again in Act II. Tickets are $40. Two votes are included with your admission. Each additional vote costs $1 and supports new talent, new works and new productions at Porchlight. I think this first-act finale is one of the finest writing Sondheim has every done. From A Little Night Music, here’s Beverly Lambert, Michel Maguire, Maureen Moore, Regina Resnik, Kevin Anderson, Susan Terry and Danielle Ferland - among other cast members – performing “A Weekend in the Country” at the Lincoln Center, 1990. Dee Hoty takes off all of her clothes in concert version of Sondheim’s Follies. This is final bows of the final night of West Side Story in Portugal, presented by Teatro Politeama. Watch the dance/bow sequences running through 3:40 – this is literally the most elaborate final bows I’ve ever seen. It really drives home the reach of Bernstein’s and Stephen Sondheim‘s work (and going even further back, William Shakespeare).. Looking at all of the YouTube videos surrounding this specific production, it seems that this was a national sensation, with the cast performing on the talk shows, morning shows, on late-night, etc.. Really amazing. Besides the final bows (just up to 3:40, as the rest is a speech by, I’m assuming, the director, Filipe La Féria), I have added what looks like an evening show’s performance of "America", the promo for the actual production, and a few other PR performances of the show. By the way, isn’t that an absolutely amazing set??!!! Teatro Politeama presents West Side Story, directed and produced by Filipe La Féria, starring Ricardo Soler as Tony, Cátia Tavares as Maria, and Lúcia Moniz as Anita.